14.6 TON CORDLESS HYDRAULIC CRIMPING TOOL (Battery: 18 V Li-ion (4Ah), Head Style: Y-750, Charger: 120 VAC, Item Weight: 17.8 lbs.) | Tallman Equipment Co., Inc. The B1350L-CA crimping tool has an OLED display which provides essential real-time tool operating information including crimping pressure and force, battery power, tool identification, LED work light state, and a number of crimp cycles. Crimping cycle data (up to 200,000 crimps) is automatically stored on a memory card and can be transferred to PC by USB interface. 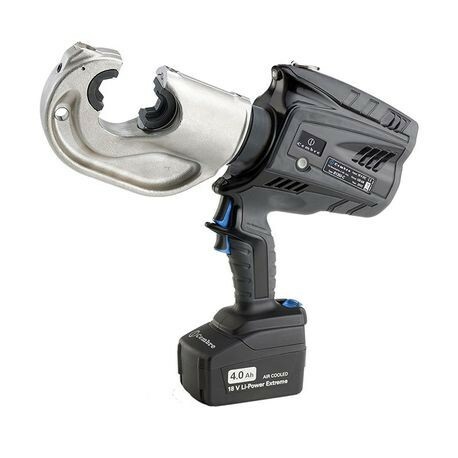 Featuring a pistol grip design, crimping head can rotate 180° and accepts 12 Ton U-Dies. Kit includes Tool, (2) 18 V Lithium-ion Metabo batteries, shoulder strap, AC charger, and Plastic carrying case suitable for storing the tool and 7 sets of semi-circular slotted dies. Dies not included, sold separately.